The Republic of Turkey, snuggled right in the middle of the Eastern and Western worlds, is an amazing place to explore and discover a new culture that is entirely its own. This country boasts everything from mountains for skiing, to canyons for exploring (including the second-largest canyon in the world); to sparkling coasts and hidden islands that are perfect for a relaxing escape. There’s also the colorful and warm culture, where generosity and hospitality are the norm and where the ancient and the modern collide to form a beautiful kaleidoscope of new and exciting experiences. But one of the best parts of traveling through Turkey is that it’s super easy to do on a budget! In this article, we’ll look at a few tips for how to get the most from your trip to Turkey, from the crowded streets of Istanbul to the ancient thoroughfares of Ephesus, even if you’re a bit short on funds. Long distance bus travel in Turkey is one of the most pleasantly surprising experiences that I’ve had there. While it might be faster to fly, the price of domestic flights can be two or three times the price of a bus ticket. The coaches are very comfortable, often more comfortable than some trans-Atlantic flights! Many routes are offered as overnight trips, with stops for meals and snacks and drinks served along the way. The best part of these long rides, though, is the view of Turkey from the window. For example, if you’re traveling through the center of the country in the summer, you’ll likely find yourself surrounded by fields of sunflowers for the better part of your journey. Taking a long-distance bus through Turkey is definitely worth much more than the price of the ticket! If you’re short on time as well as cash, don’t worry! You can still usually swing a good price on a Turkish budget airline, such as Pegasus or Onur Air. Their best prices usually apply to domestic flights, which is perfect if you’re trying to get from Istanbul to Izmir, Cappadocia or other far-off places. They’re based in Istanbul, as are most people who travel through Turkey, which means that flying to and from Istanbul with these airlines is usually affordable and hassle-free. It’s a great way to save money while saving time, as well! 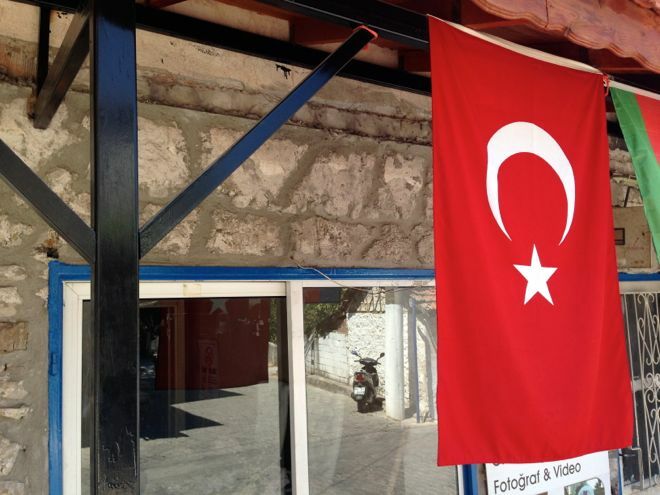 The Turkish ideals of generosity and hospitality extend far into the hostel business as well. While you can find large hotels with familiar, international names, you’ll be able to save money and gain so much experience by staying in local hostels. Many hostels are listed on popular booking sites such as Booking.com and Hostelworld.com, and they are very affordable compared to hostels in other parts of Europe. Airbnb and Couchsurfers are other great ways to save money while making great contact with locals. If you’re lucky, you may find yourself invited to a Turkish home as a guest. Be sure to read up on the proper etiquette before you go, and be prepared to have a wonderful time! You’ll often find that your host is eager to show you around and make sure you feel at home in Turkey! Alternatively, choose to cash in your rewards points for a hotel stay. You can earn points towards free nights at Marriott Hotels by using this card when you shop. Aside from transportation and accommodation, which we’ve already explored, food is the next biggest expense for travelers. Luckily, Turkey has a vibrant street food culture, and compared to other places in the region, very cheap food costs overall. Some of the most delicious and the most Turkish of all foods are actually the most affordable as well! By simply walking down the street, you’ll find a plethora of delicious and cheap foods that will cater to the tastes of any traveler. Even vegetarians will have a pretty easy time finding affordable food without even walking into a restaurant! Of course, restaurants are also pretty inexpensive when you get out of the more touristic areas. The easiest way to eat out without spending too much money is to eat at local places in more residential areas. While it may be a bit daunting to travel off the beaten path a bit, you’ll find that the food, and the price, is usually much better when you step outside of the tourist bubble! The best and easiest way to stay safe in Turkey is to have open communication lines and let people know where you are at all times. This is easy to do, since there is WiFi in almost every café and shop. However, it can be a bit tricky if you’re traveling from outside of the country and rely on social media such as Facebook, Messenger or Twitter to stay connected, since the Turkish government has been known to block these sites in the past. The easiest way around this is to install a Virtual Private Network (VPN) on your mobile device. It will enable you to hide your IP address and convince your social media account of choice that you’re still in the US. Other ways to stay safe and enjoy your trip include staying aware at all times and sticking with groups of other travelers. These are also great ways to make new friends and lasting memories as you travel! Turkey is a country like no other: it’s full of new surprises at each and every turn! There’s an endless history and limitless potential to explore and discover all over the country. Fortunately, you don’t have to be fabulously wealthy to have an amazing time in Turkey!